Just one week after the race in Tartu, Cato Cassiers had another appointment with the European stage. Tabor (Czech Republic) was the place to be. This time, Cato wasn’t alone for No Limit Team, Lotte Vandekerckhove also made the transfer to Tabor for her fist experience in an ETU-Cup race. After another hard swim, Cato came out of the water around 15th position. Lotte, who might have been a little bit impressed about the circumstances, came out of the water in 43th position. 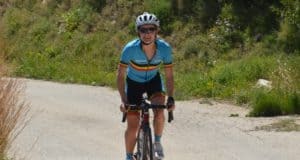 Cato, who had the fastest bike time overall, could make immediately connection with the front group, Lotte also had a strong bike ride made up some places too. Luckily this time no problems for Cato and Lotte. After a descent run Cato could bring a top-8 place home, her best position ever on European level. Lotte’s first race at this level was good for a 33th place. Well done ladies, that tastes for more!